A guyot (pronounced /ɡiːˈjoʊ/), also known as a tablemount, is an isolated underwater volcanic mountain (seamount), with a flat top over 200 m (660 ft) below the surface of the sea. The diameters of these flat summits can exceed 10 km (6.2 mi). The guyot was named after the Swiss-American geographer and geologist Arnold Henry Guyot (died 1884). The term was coined by Harry Hammond Hess. Guyots are most commonly found in the Pacific Ocean. Guyots show evidence of having been above the surface with gradual subsidence through stages from fringed reefed mountain, coral atoll, and finally a flat topped submerged mountain. The steepness gradient of most guyots is about 20 degrees. To technically be considered a guyot or tablemount, they must stand at least 914 m (3,000 ft) tall. However, there are many undersea mounts that can range from just less than 91 m (300 ft) to around 914 m (3,000 ft). Very large oceanic volcanic constructions, hundreds of km across, are called oceanic plateaus. Seamounts are made by extrusion of lavas piped upward in stages from sources within the Earth's mantle to vents on the seafloor. Seamounts provide data on movements of tectonic plates on which they ride, and on the rheology of the underlying lithosphere. The trend of a seamount chain traces the direction of motion of the lithospheric plate over a more or less fixed heat source in the underlying asthenosphere part of the Earth's mantle. There are thought to be up to an estimated 50,000 seamounts in the Pacific basin. The Emperor Seamounts are an excellent example of an entire volcanic chain undergoing this process and contain many guyots among their other examples. 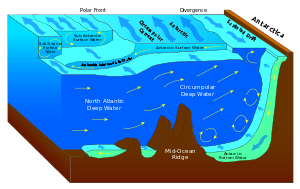 Another factor contributing to the guyots being underwater has to do with the oceanic ridges, such as the Mid-Atlantic Ridge in the Atlantic Ocean. Mid-ocean ridges gradually spread apart over time, due to molten lava being pushed up under the surface of the earth and creating new rock. As the mid-ocean ridges spread apart, the guyots move with them, thus continually sinking deeper into the depths of the ocean. Thus, the greater amount of time that passes, the deeper the guyots become. Although guyots can be hundreds of millions of years old, there have been some recently discovered guyots that were only formed within the last 1 million years, including Bowie Seamount on the coast of British Columbia, Canada. One guyot in particular, the Great Meteor Tablemount in the Northeast Atlantic Ocean, stands at more than 4,000 m (13,123 ft). The guyot's diameter is 110 km (68 mi). Guyots are also associated with specific lifeforms and varying amounts of organic matter. Local increases in chlorophyll a, enhanced carbon incorporation rates and changes in phytoplankton species composition were associated with the seamount. Guyots were first recognized by Harry Hammond Hess in 1965 who collected data using echo-sounding equipment on a ship he commanded during World War II. The data showed the configuration of the seafloor where he saw that some undersea mountains had flat tops. Hess called these undersea mountains 'guyots' because they resembled Guyot Hall, the flat roofed biology and geology building at Princeton University which was itself named after the 18th century geographer Arnold Henry Guyot. Hess postulated they were once volcanic islands that were beheaded by wave action yet they are now deep under sea level. This idea was used to help bolster the theory of plate tectonics. 1 2 "Seamount and guyot". Access Science. McGraw Hill Education. Retrieved 2 February 2016. ↑ Hillier, J.K. (2007). "Pacific seamount volcanism in space and time" (PDF). Geophysical Journal International. 168: 877–889. doi:10.1111/j.1365-246X.2006.03250.x.